Born in 1892, Christian (Chris) Bohman had been apprenticed as a coachbuilder in his hometown of Stockholm, Sweden. He immigrated to New York City in 1910 and quickly found work fitting interior woodwork and hardware to completed coach bodies at three of Manhattans most famous firms; Holbrook, Brewster and finally Healey & Company. Following the purchase of Healey & Company (his current employer) in 1921 by the Walter M. Murphy Co., Bohman moved to Pasadena and became chief body assembler for the new firm. Early B & S work consisted of repainting and collision repair work for their automobile row neighbors in Pasadena. As news of their previous association with Murphy got around, they found that the were able to inherit Murphy’s fine reputation as well as quite a few of his employees. Under their own management Schwartz took charge of the manufacturing and Bowman became sales and business manager. Bohman was blessed with a wry sense of humor that took the edge off his rigid discipline. Later, it also helped greatly in putting Bohman & Schwartz clients more at ease during contract discussions. He was an excellent businessman and could easily level a supplier or designer with an unblinking eye and yet hold the meeting with casual informality. Consequently business increased and the pair soon located to larger quarters at 326 West Colorado Avenue in Pasadena, California. Workmanship of the highest quality was the only standard acceptable to Schwartz, and it was on this basis that Bowman was successful in selling the craft of the shops whose personnel included Milt Pfeiffer, metal man; Lou Morse and (later) Rufus L. (Whitey) Compton, trimmers; Frank Flores; Gatford (Bill) Williams, power hammerman; Mark Farlow, metal fabricator and finisher; Bill Courtemange, painter; Jack James, general delivery and customer liaison; and Lamar Bresee, interior designer and salesman. Bresee was an accomplished artist and sculptor and his beautiful renderings and suave presentations won over many of the firm's celebrity clients. Former Murphy designers Herb Newport, Franks Spring and W. Everett Miller were called upon to contribute designs and layouts for many of the prestigious B&S clients who were willing to pay for their talents. Their combined talents produced some of the most famous and outrageous custom Duesenbergs ever made. Clients included Clark Gable, Ethel Mars (Mars candy), Count Serge M'Divani, Kid Spaulding, Jeanette MacDonald, Bill “Bojangles” Robinson, Barbara Hutton (Woolworth heiress), P. K. Wrigley Jr. (Wrigley gum), Father Divine, Henry Topping Jr., Roy del Ruth (movie director) and Rust Heinz (son of H. J. Heinz of 57 Varieties). They also built a number of cars for the motion picture industry, which include a number of Cadillac and LaSalle woodies for transporting employees as well as two famous movie cars, Rust Heinz’ radical Phantom Corsair (featured in “Young At Heart”) and the custom Buick featured in the the Hal Roach movie “Topper. All of the work to be performed on Bohman and Schwartz bodies was done in their own shops under the scrupulous eye of Maurice Schwartz. This included initial woodwork, metal skins for the bodies, the upholstery, top work, painting, interior woodwork, hardware, etc. Almost all work commenced with new chassis, although, at the insistence of some owners, considerable modifications were made to existing bodies created by others. Hollywood’s elite also sought them out to restyle existing chassis that still had some miles left, but whose bodies were too outdated to be seen around town. Some bodies were dramatically re-styled, but most of their work consisted of cosmetic changes such as bullet headlights, fender skirts, and new moldings and paint schemes. Many of the Duesenbergs bodied by Bohman & Schwartz were put on existing earlier chassis that had formerly been limousines. A signature B & S Duesenberg was the 1936 town car built for Mrs. Ethel V. Mars of Chicago. It featured a radically sloped radiator shell and long, tapered, pontoon fenders with aerodynamic spare tire covers that flowed into the fenders. The same hammer forms used to make the fenders and spare-tire covers were re-used over and over and became a Bohman & Schwartz signature that enables you to spot many B & S–bodied cars from a great distance. Bohman & Schwartz also built the most hideous Duesenberg of all time, the 1937 “Throne Car” built for 1930's evangelist M.J. “Father” Divine This 7,000 lb. monster was built on a stretched 178” wheelbase and featured a motorized throne that could elevate “Father Divine” so he could be better seen by his followers. Its whale-like body spilled over the sides of the chassis to such an extent that the outside of the rear fenders lay underneath the coachwork. When fully loaded, it regularly broke its rear wheels as even the over-engineered Duesenberg chassis couldn’t take the extra weight of the monstrous body. In 1937 Bohman and Schwartz also undertook their most famous (and beautiful) creation, the building of a futuristic shark-like body designed by H.J. Heinz’ son, Rust Heinz, and placed on a custom-built 1936 Cord 810 chassis. Called the Phantom Corsair, it later appeared in the 1938 David O. Selznick movie “Young In Heart” as the mysterious Flying Wombat automobile. It was purchased in 1947 by car collector Richard Rush for $5,000. Rush sold it to Los Angeles radio and television personality Herb Shriner in 1951. Shriner had the car repainted and modified to allow better cooling for its Cord powerplant, but the results were not very pleasing to the eye. William Harrah purchased it in the 1960s and had the car restored back to its original state and it currently resides in the National Automobile Museum (The former Harrah Collection) in Reno, Nevada. Another striking car was built for and designed by Marquise Hachisuka a talented mechanical engineer. The 1937 Lincoln Zephyr was totally redesigned and featured one-piece removable front fenders, blanked in backlight, blanked in rear windows and recessed headlights. Elderly customers enlisted B&S to move their cars' roofs up to a more aristocratic height, while others ordered motorized rear seats than enabled them to enter and exit without difficulty. For the wheelchair bound, they devised portable aluminum tracks that could move a chair in and out of the vehicle, and built wheelchairs to match the cars interior. They also developed a wheelchair turntable for the rear compartment, a ninety degree rotating front seat for easy access, and a front seat wheelchair lift that allowed the invalid to sit in the front seat. When running boards were eliminated during the 1940s, B&S modified new cars by adding disappearing step boards for easier rear entry. Encouraged by Dutch Darrin's success with Packard Darrins, B&S built a series of similar European-style convertibles on various chassis. A 1939 LaSalle and two '40 Cadillacs were built on speculation (i.e., without a firm order), in conjunction with designer W.E. Miller, but half a dozen 1940 Packard 180 4-place convertibles with cut­down doors and speedster windshields (Darrin clones) were ordered (and paid for) by Thompson Motors, the Pasadena Packard dealer. They also built a few woodie wagons on Rolls-Royce, Chrysler, Cadillac and LaSalle chassis from 1939 through 1942. B & S survived WWII by doing sheetmetal subcontract work for aerospace industries and moved to a two story shop at 306 North Hudson Avenue in 1945. The partnership was amicably dissolved in 1947, and Bohman formed a new partnership with his son, Lawrence Christian Bohman, called C. Bohman & Son which was housed in the first floor of the building. Lawrence Christian (Chris) Bohman continued the business after his father's death in February, 1950 building many ‘formal’ Derham-style conversions by blanking out the rear quarter windows on Cadillac and Lincoln limousines. He also built two from-the-ground-up aluminum sports car bodies in 1950-1951, one for Rosan Engineering on a 6-cylinder Maserati chassis, a second on a Buick V8-powered 1947 Ford chassis. 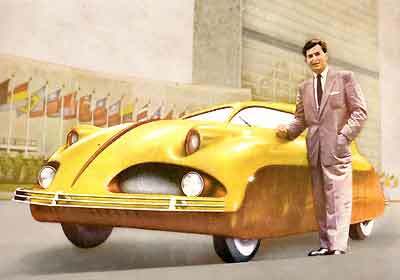 The latter car, known as the Bohman Special, appeared in the 1954 Tony Curtis feature film ‘Johnny Dark’. After filming concluded, Bohman offered the car for sale, an ad for the ‘1953 Custom Sports Job’ appearing in the March 1954 issue of Motor Trend magazine. 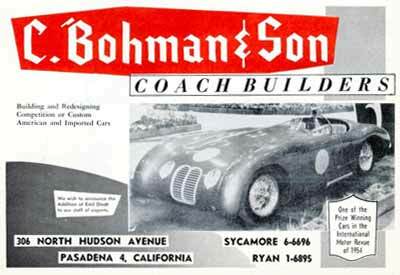 Although the whereabouts of the Maserati-based sports car are unknown, the Buick-powered Bohman Special survives. Ironically in both 1948 and 1954, Mobil Oil called upon the younger Bohman to first, modify the body (1948) and second, to replace the chassis (1954) on the former Bohman & Schwartz-built “Topper” movie car, which had now been converted to an advertising wagon. 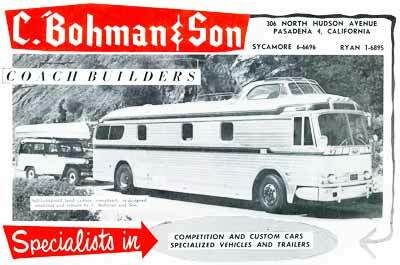 In the late 1950s Bohman constructed an unusual custom coach, dubbed the Savitar by its owner, Hollywood agent Phillip Berg, using a used Greyhound-liveried GMC coach topped off by a Mercury Sun Valley-sourced observation dome. Bohman retired in the 1980s and the firm’s factory was demolished in 2002 to make way for the Pasadena Gateway Villas, a high-end apartment complex. At the time of the dissolution Maurice Schwartz moved his machinery upstairs and continued building special bodies there until the 1950 death of his former partner, after which Lawrence Christian Bohman assumed control of his father’s business affairs and sent him packing. Maurice Schwartz relocated to a small shop located at 1901 E. Walnut St., Pasadena, and made quite a reputation for himself creating custom-built station wagons. Notable Schwartz creations from the time include a series of Cadillac woodies that were built for Hollywood stars such as Gene Autry, Marie McDonald (a gift from millionaire husband Harry Karl) and Mexican president Miguel Aleman. Between 1947 and 1949, six Cadillac woodies were purchased by Metro-Goldwyn-Mayer studios, of which one was built on Cadillac’s 163” commercial chassis and featured 6 doors. He also built a handsome 3-passenger coupe on a 1949 Cadillac Series 75 chassis and a formal town car on another Cadillac commercial chassis in 1949 for Mrs. Morgan Adams. 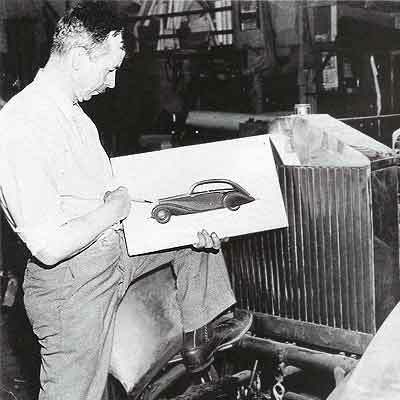 Through the 1950s he survived through normal body shop work, modifying vehicles for invalid use, and building replica bodies for the late William F. Harrah’s Reno, Nevada collection. Schwartz remained active right up until his death in 1961 at the age of 76. Surprisingly his Walnut St. works remains standing, located adjacent to Honda of Pasadena. "I have some information about the Phantom Corsair. I worked for the Dossin Food Products in Detroit, Mich. 1944. Mr. Roy Dossin came to my desk and asked if I would pose for the car of the future. We went out in the parking lot saw the car and met Mr. Heinz. 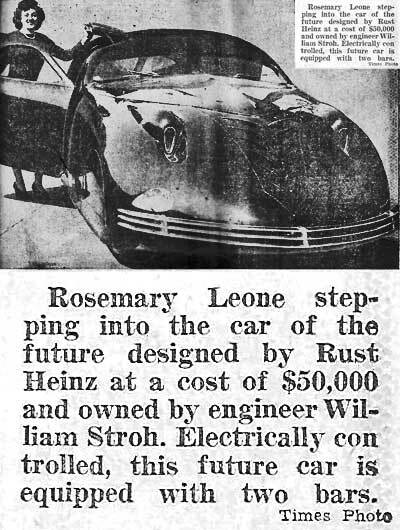 They took a photo of me and the car and it appeared in the Pictorial section of the Detroit Times, April 12, 1944. "This is the photo as it appeared. I still have the original section of the old newspaper. I am now 92 years of age and remember that day.